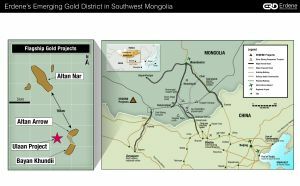 Erdene Resource Development Corp. (TSX:ERD) ("Erdene" or "Company") is pleased to report the closing of its previously announced agreement (the "Agreement") to acquire a 51% interest in the Ulaan exploration license, adjacent to the Company's high-grade Bayan Khundii gold project, with the option to acquire up to 100%. 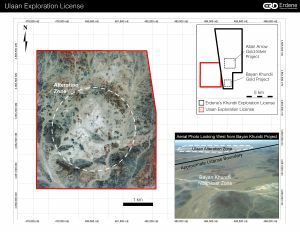 The Ulaan exploration license ("Ulaan" or the "Property"), located immediately west of the Company's 100%-owned Bayan Khundii gold project license, covers an area of approximately 1,780 hectares. The property hosts a very large, 3-kilometre diameter, intense alteration zone with characteristics thought to be related to a porphyry copper and epithermal gold system. Although the Property has no history of drilling or trenching, rock chip and stream sediment geochemical sampling has identified anomalous concentrations of gold, copper and molybdenum in the surrounding area, and recently completed geophysical surveys have produced a number of follow-up targets. Exploration programs are being formulated with work to commence this quarter. 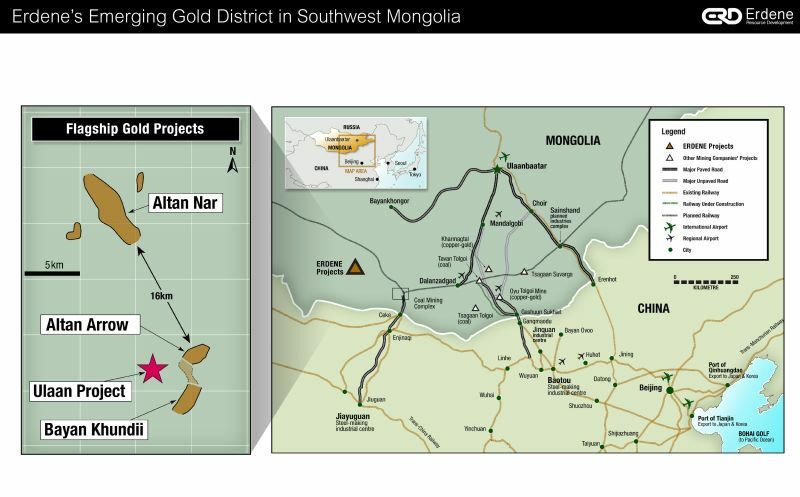 In addition to planned exploration at Ulaan, the Company continues with drilling programs at its neighboring, 100%-owned Bayan Khundii, Altan Nar and Altan Arrow gold projects. Under the terms of the Agreement, Erdene has acquired 51% of the outstanding shares of Leader Exploration LLC ("Leader"), a private Mongolian company that currently owns the Property, from Erdenechuluun.Z and Erdenekhuyag.Z for US$750,000. Provided Erdene spends a minimum of US$600,000 on work expenditures on the Property over the next three years, it has the right to acquire the remaining 49% of the shares of Leader from Erdenechuluun.Z or, at Erdene's option, a portion of the Property, for the then fair market value of the Property or the portion to be acquired. Erdene may extend the option beyond three years by spending a minimum of US$100,000 per annum on work expenditures. Erdene Resource Development Corp. (TSX:ERD) is a Canada-based resource company focused on the acquisition, exploration, and development of base and precious metals in underexplored and highly prospective Mongolia. The Company has four exploration licenses and a mining license in southwest Mongolia. 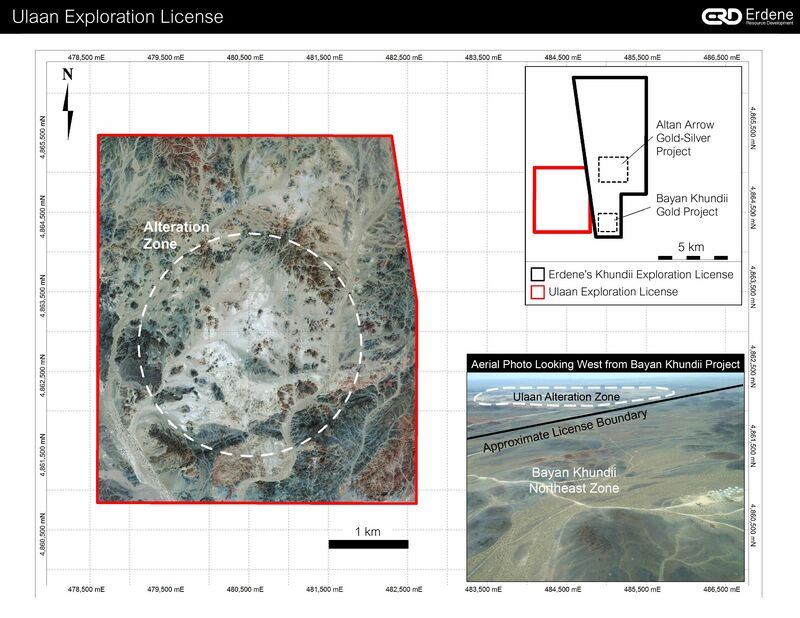 Exploration success has led to the discovery and definition of several 100%-owned prospects and deposits including the Company's flagship and newly discovered, high-grade, near-surface Bayan Khundii gold project; the 5.6 kilometre long Altan Nar gold-polymetallic mineralized trend that is host to 18 targets; the Altan Arrow gold-silver prospect; the Khuvyn Khar copper-silver prospect; and the Zuun Mod molybdenum-copper deposit. For further information on the Company, please visit www.erdene.com. Erdene has 145,963,086 issued and outstanding common shares and a fully diluted position of 156,592,160 common shares.